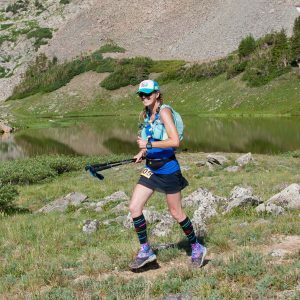 Shari has been running for about three years, and she ran her first trail marathon in Salida in the spring of 2016. That fall she also ran her first 50 mile ultra, and she’s been hooked ever since. When she’s not running, Shari is a wildlife health technician with Colorado Parks & Wildife, a job she loves for the chance it gives her to see and work with all kinds of cool critters, both big and small. And being outside is where Shari’s passion lies, whether for work or play. Some of Shari’s favorite local trails are in Lory, the area of Red Feather Lakes north of town, and up on Cameron Pass. And whenever possible she gets out with her two favorite running partners, LB and Poke.